What are individual lashes? Individual Lashes differ from the traditional “strip” lashes as they aren’t applied all at once. They are applied individually. 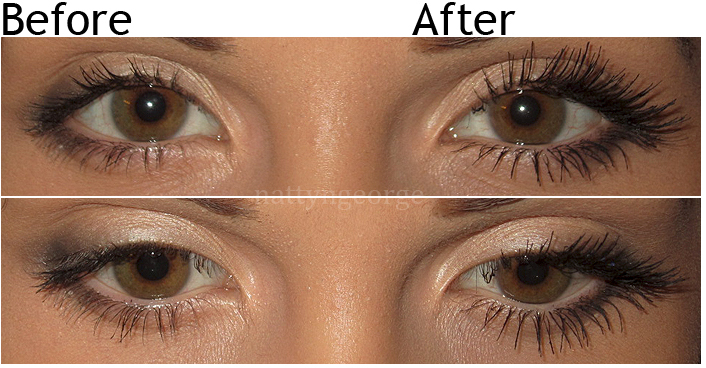 Individual Lashes are mainly sold in “flares” or, small clusters of about 5 – 10 lashes. They typically come in three different lengths; Short, Medium and Long. Why individual opposed to strip? The awesome thing about individual lashes, is you can control exactly how you want your lashes to look. With strip lashes, you don’t have as much control. Individual lashes are very fun and you can layer them on top of each other for very voluminous & dark lashes and you can mix up the sizes for any look you please. 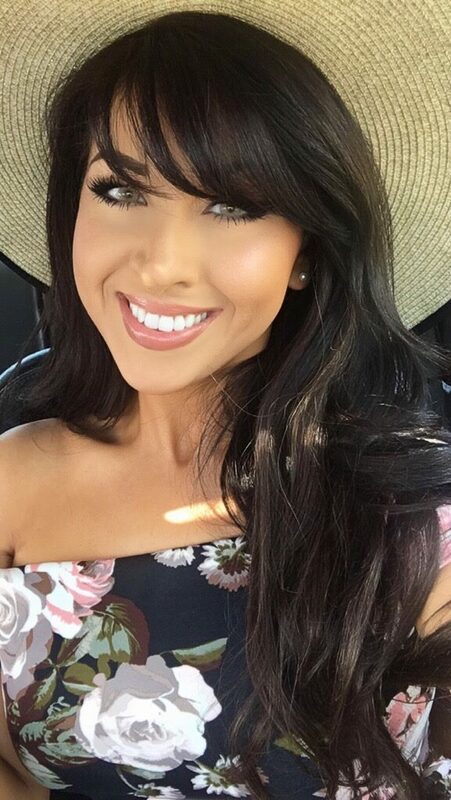 Also, if you want added length, but want to keep your look extra natural, individual lashes are great, because you can add a few flares to the top corner of your lash line and your eye shape will look elongated & your overall look will be more “girly”. Short flares starting at the corner (where your lashes are the shortest), then medium flares towards the middle, and long flares toward the end. 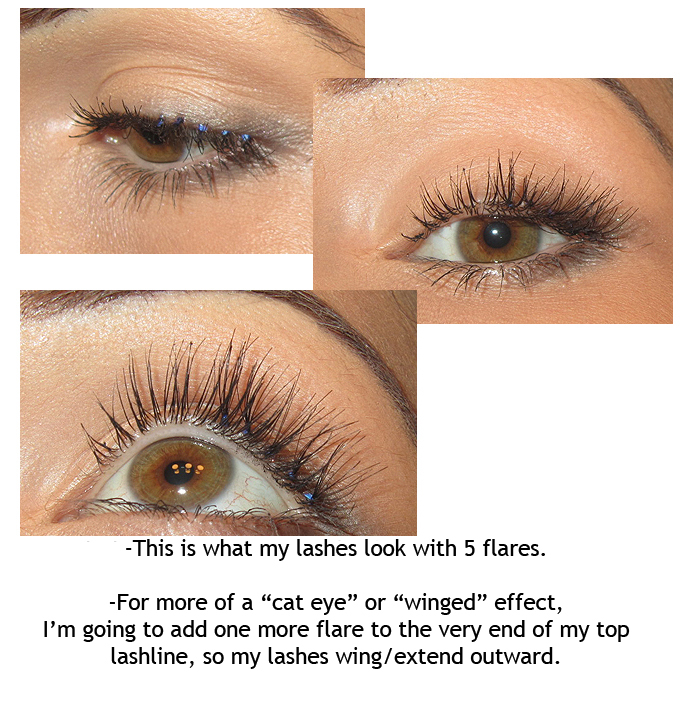 Medium flares all across with long flares on top for long, and thick dramatic lashes. Medium flare, short flare, medium flare, short flare all the way across. Long flare, medium flare, long flare, medium flare all the way across. Remember, you can add them wherever you want! You don’t have to apply them all across your lashline. You can apply them wherever you want added length or volume. Step 1: First, apply all of your eye makeup, as applying false lashes should be your last step. Apply one coat of mascara. Step 2: Squeeze a small amount of lash adhesive on a clean surface. I’m using my lash tray as a surface for my adhesive. Then, pick up one flare with your tweezers. Pick them up as close to the bottom as possible. Don’t apply too much pressure or you can bend the lashes. Then, dip the end in the adhesive. Step 4: While looking forward in a mirror, tilt your head back slightly so your eyelid flattens. You should have a clear view of your lashline. You can start from any area you want, but I like starting from the middle. So, starting from the middle, place the lash down on your lashline, as close as possible to the roots of your natural lashes, but not on top of them. The glue should be on your eyelid, not your lashes. The flare should be laying on top of your own lashes. 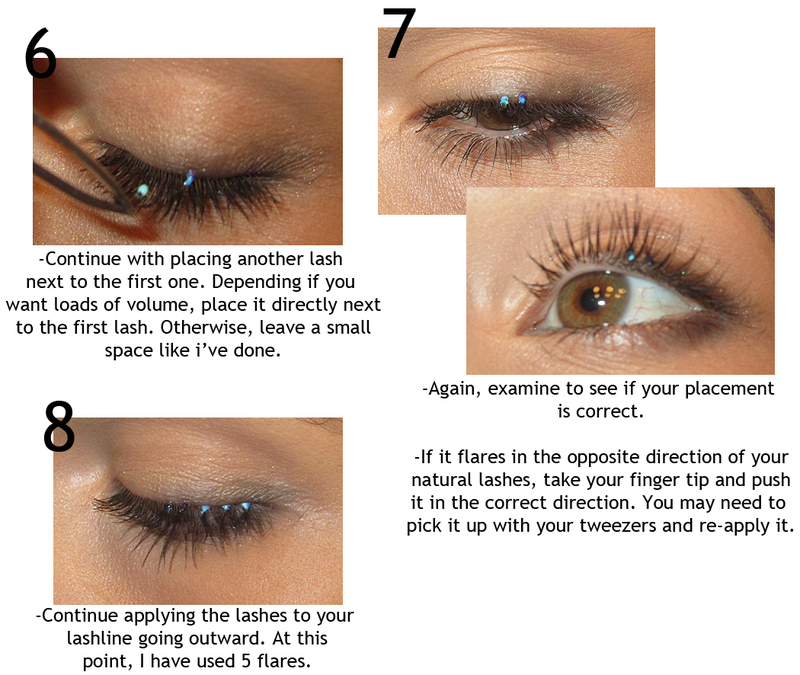 Step 5: Close your eye that you just placed the lash on. Examine your placement with your other opened eye. The false lash should be going in the same direction as your natural lashes. If they are going in the opposite direction, take your fingertips and push them slightly so they are going in the correct direction. Step 6: Continue with placing another lash next to the first one. If you want thick lashes, apply it directly next to the first one. For more of a natural look (what I’m doing), leave a tiny space in between. Step 8: Continue applying the lashes to your lashline going outward. At this point, I’ve applied 5 flares. You can click on the image to see a close up of the image. You can see how much of a space I left in between each flare for an overall natural look. Step 9: To make your lashes extend outward, add an extra flare to the very end of your lashline. Step 10: Wait at least 5 minutes. Once the glue is completely dry, very carefully apply a coat of mascara to your top and bottom lashes. You want to be gentle because you can make the mistake of lifting some of the lashes off with the mascara wand. MAC Brown Down & Brun Eyeshadow Review, Swatches and Comparisons! wow, they look great and so natural! Really looks natural on you! Your tutorial layout looks like it belongs in a magazine! I literally got individual lashes yesterday and couldn't figure out how to get them on! lol Everytime I put them on they would just fall off again! But it was coincidental that you just happened to do a post about individual lashes right when I needed the help! lol So thanks for the post and I will try to use the tips! Excellent post I am totally going to try them, following your instructions . LOVE it !!!!!!!! WOW Great results! I've never tried individual lashes, I've always used the single strip ones. Definitely trying these! ❤ the post! your lashes are already nice without it!! thanks for the tut. Geesh your posts inspire me !!! You should make videos !!! What cam do you use ? Great tutorial! Thanks natty. 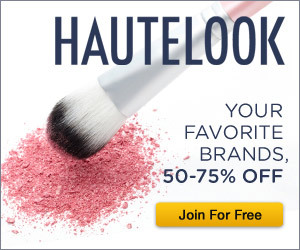 Funny that i just bought individual lashes today BEFORE reading this post. Thanks !! I'm so glad you posted this, I bought a bunch of individual lashes from ELF thinking they'd be easy peasy to apply, but I have no clue on what I was doing. I love the effect it gives your eyes! And I loveeee that you posted different ways to use them, I would of never thought of that! great tutorial hun!now I'm not that scared woth individual lashes!thought that I cant make it! !But it seems easy!! what kind of mascara are you using? Thank you MaviDeniz & Darlene! Eileen – Don't be intimidated! Really, they are so much easier than you think! I'd recommend trying ELF, as you can practice with them and they are only $1 a pack. Pretty guilt free – and they are actually pretty good! Max – Yes you should!!!!! 😀 I don't write this stuff for nothin.. HAHA!! Emily D – Yess! Good timing. lol If they kept falling off, it's possible you weren't using enough glue/and or you didn't wait long enough for the glue to set. You just literally have to lay them on top of your lashes, touching your lashline. Then wait a bit before touching them or applying mascara. They shouldn't move after the glue has set. Jess126xo – Aw, thanks! I hopefully will sometime in the future. I use a Canon Powershot SD3500 IS 14.1 Megapixels. Canon Powershots are my favorite point and shoot cameras! Donna – TY! Glad you liked it! Arezu – The trick is mostly to have them lay on your natural lashes. 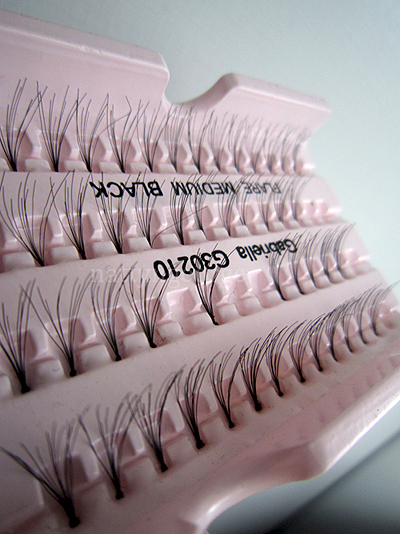 Your natural lashes are like a little bed for them that should hold them in place while the glue sets. Liparazzi – Yay! Let me know how it goes! Lovely. You did an awesome job. wow they look natural.. I have been wanting to try this..
this is not uncomfortable to you? I mean having something so near of your eye? this is one of the thing that I really admired from girls, the bravery to do something like this. How long do they last/ how long do you keep them on? And what remover do you use? These really look great!! To be sure, does the glue go onto the lid or your own lash? I never get them this perfect. Need to re-try with your method. Thanks for the post! I tried putting those on my lid, and it didn't work out right but when I glued them to my lashes, they stayed on. I think it is really hard for the individual lashes being stuck to the eyelid, you basically have to glue them to your lashes.